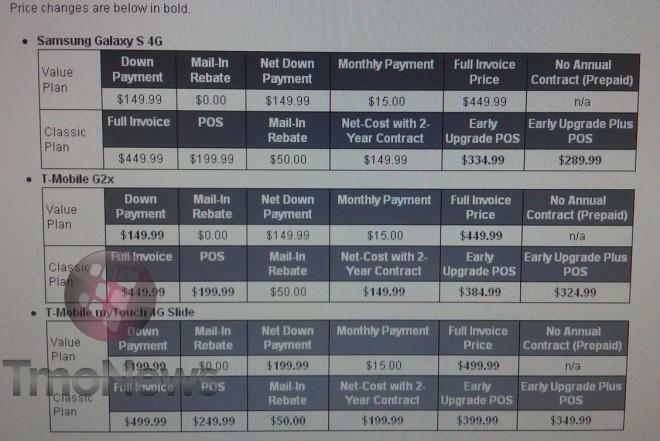 Right on the heels of the T-Mobile.com price drop on the T-Mobile G2x we received an email with this ninja screen shot showing price changes taking effect and the G2x is front and center. The G2x will drop on the classic plan to $199.99 with a $50 mail in rebate bringing the net 2 year contract cost to $149.99. Value plan customers wishing to order the G2x will plunk down an initial down payment of $149.99 with $15.00 monthly payments. MyTouch 4G Slide Value Plan subscribers will make an initial down payment of $199.99 with $15.00 monthly payments thereafter. There you have it, some price changes in effect yo! Really not liking the G2x at all. So the price change has no effect on me, but it would be nice to replace this horrible phone with the T-Mobile G2. I called Customer Loyalty yesterday and they were offering me the G2 as a replacement for my G2x. I’m currently on my 4th G2x and would’ve taken the offer, but I’m really not a fan of physical keyboards. The G2 is also a step down. Screen is smaller, 800Mhz processor vs 1Ghz Dual Core (2Ghz total), 1080p video recording with HDMI slot on G2X vs 720p no HDMI on G2. Good thing you didnt take it. Its a Personal Preference concerning certain things. I had the G2x and playing with these devices side by side I’ll take the G2. Price drops are always good news yo! Notice: This proves i’m right about EIP not being available for Even More customers any longer. The g2x is online free right now through thursday! FREE if you’re not a current customer or add a line with data plan. Unfortunately, for some reason the EIP plans aren’t showing up for EM+ accounts. Are we expected to switch the the Value plan before the upgrade, and get locked into a contract BEFORE we can even begin the upgrade process? What gives? EIP is ONLY available now on Value plans… Which is totally bogus, that is part of the reason people went with EM+ plans in the first place, and then they just pull the rug out and now EM+ are expected to just pay full price out of pocket or switch to a contract. What are y’all talking about? I have EM+. SO, I dont know the acronym EIP. I assume I cant get the free g2x offer online even though with EM+ I have “no contract”…..
Basically financing your phone with your calling plan separate. So you could pay off your phone early or ride it out over the duration of your calling plan. I loved having the EM+ in the past, but switched to a family plan over the years. I’m a EM+ customer and was told by two different customer service reps that due to my EM+ status, my ONLY option is to switch to a Value plan, that Classic plans will not be available to EM+ customers, and that once on a Value plan, I will also never be able to switch to a Classic plan. My equipment is paid off, I just… can’t have a T-Mo contract. Ever. And of course EM+ turned out not to be the savings I expected, since the phone I purchased at full price was the loathesome Moto Cliq, which has been replaced three times and is once again going bad, only now no longer under warranty, (each handset makes it about 4 months before it’s unusable) just over a year later. Also, both customer service reps were quite rude- a first in my time as a T-Mo customer. Bad reception, incipient ATT deal, rude CSRs, and expensive phones? Yeah, why am I still with the underdog, again? After 8 years as a T-Mobile customer, I’ll be switching to Verizon. Just called Tmo to go from flex to contract. i was told a week ago that i qualified for an equipment upgrade along with my contract and that the handsets would be discounted as such. Fast forward a week later and was asked to sign a contract and no phone discount. Why the frak would anyone sign a contract under those circumstances? Let the transfer of crappy ATT cust svc begin.